Sir John Berry Hobbs (16 December 1882 – 21 December 1963) was an English professional cricketer who played for Surrey from 1905 to 1934 and for England in 61 Test matches between 1908 and 1930. Known as "The Master", he is regarded by critics as one of the greatest batsmen in the history of cricket. He is the leading run-scorer and century-maker in first-class cricket, with 61,760 runs and 199 centuries. A right-handed batsman and an occasional right-arm medium pace bowler, Hobbs also excelled as a fielder, particularly in the position of cover point. Born into poverty in 1882, Hobbs wished from an early age to pursue a career in cricket. His early batting was undistinguished, but a sudden improvement in 1901 brought him to the attention of local teams. In 1903 he successfully applied to join Surrey, with the support of England batsman Tom Hayward. His reputation grew and when he qualified to play for Surrey, he scored 88 on his first-class debut and a century in his next game. Over the following seasons, he established himself as a successful county player and in 1908 made his Test debut for England, scoring 83 in his first innings. After some mixed early performances for England, Hobbs' success against South African googly bowlers made his place secure, and by 1911–12, when he scored three centuries in the Test series against Australia, critics judged him the world's best batsman. In county cricket, he developed an attacking, dynamic style of play and was very successful up until 1914. After serving in the Royal Flying Corps during the First World War, he maintained his reputation when cricket resumed in 1919, but his career was threatened by appendicitis, which caused him to miss most of the 1921 season. When he returned, he was a more cautious batsmen and used a safer style of play. Subsequently, he became more consistent and scored prolifically in both Test and domestic cricket until his retirement. In this period, he played some of his most acclaimed innings. Hobbs' success was based on fast footwork, an ability to play many different shots, and excellent placement of the ball. Among the first batsmen to succeed against previously devastating googly bowlers, he adapted his technique to meet the new styles of bowling that arose early in his career; he mixed classical shots with an effective defence. He was particularly successful on difficult pitches for batting. An opening batsman, Hobbs established several effective opening partnerships; with Tom Hayward and Andy Sandham for Surrey and with Wilfred Rhodes and Herbert Sutcliffe for England. His partnership with Sutcliffe remains in 2016 the most effective for the first wicket, in terms of average partnership, in Test history. Contemporaries rated Hobbs extremely highly, and critics continue to list him among the best batsmen of all time. Hobbs' breakthrough came in 1901. His batting improved throughout the season, during which he scored 102 for Ainsworth against the Cambridge Liberals, his first century. At the end of the season, he was included in a Cambridge XI, a team chosen from the best local cricketers, to play a prestigious match against a team of professional cricketers brought by the Cambridge-born Surrey cricketer Tom Hayward. Hobbs' overall record was unremarkable, but at the end of the season he was invited to play as an amateur for Cambridgeshire; he achieved little in his appearances. Hobbs was summoned to Surrey for a trial in April 1903, and subsequently offered a contract with the ground staff at the Oval on a basic wage during the season of 30 shillings a week. Hobbs could not immediately play for Surrey owing to the qualification rules in place at the time for the County Championship—a player had to be born in a county or to have lived there for two years in order to represent it. To achieve qualification, he moved to the Surrey area of London. Around this time he played football for local teams as a forward with some success, but struggled financially during the winter months and found it hard to find employment. By the start of the 1905 season, Hobbs had qualified for Surrey and was already being noted as a player of promise. At the time, Surrey needed an opening batsman to partner Tom Hayward. Although Hobbs had rarely opened the batting, he was selected as Hayward's opening partner for Surrey's first game of the season. He made his debut on 24 April 1905 against a team representing the "Gentlemen of England"; after scoring 18 runs in the first innings, he scored a rapid 88 in the second before rain ensured the match was drawn. The Surrey team and committee were impressed, and Hobbs retained his place for the club's opening County Championship match against Essex. When he scored 155 runs in around three hours during Surrey's second innings, the Surrey captain Lord Dalmeny awarded Hobbs his County Cap. Over the following weeks, Hobbs scored consistently, hitting another century against Essex and 94 runs against the touring Australian cricket team. But a combination of fatigue from continuous cricket and the pressure of first-class cricket adversely affected his form, and he struggled for the remainder of the season even as the county tried various measures to help him. In first-class cricket that season, Hobbs scored 1,317 runs at an average of 25.82, including two centuries and four other scores over fifty, to finish ninth in the Surrey batting averages. As an occasional medium-paced bowler, he took six wickets. Reviewing Surrey's season, Wisden Cricketers' Almanack singled Hobbs out for attention, praising his early-season form; it suggested that he was the best professional batsman Surrey had found for a long time. The Times noted that, while performing well, Hobbs had fallen short of the standards suggested by his start. After a winter of practice, Hobbs displayed greater consistency in 1906. Displaying a wider range of shots, he scored four centuries, including another against Essex, and established an effective opening partnership with Hayward. Between his debut and Hayward's retirement in 1914, the pair shared 40 opening partnerships in excess of 100 runs. Hobbs was generally the junior partner, and was overawed by Hayward, to the extent that he did not feel confident enough to invite him to his wedding. Hayward influenced Hobbs' mental approach, particularly his running between the wickets, but the pair were dissimilar in style. In all first-class cricket in 1906, Hobbs scored 1,913 runs at an average of 40.70 with a highest score of 162, placing him second in the Surrey averages. Wisden praised his improved fielding and commented that he was "one of the best professional bats of the year". Hobbs made further advances in 1907. Unusually frequent rain during the season—Wisden described the season as the wettest ever—meant that pitches often favoured bowlers. After a poor start, Hobbs successfully adapted to the conditions, and scored consistently well. In June, he and Hayward shared four century opening partnerships in one week. Hobbs scored four centuries in total and by the end of the season had scored 2,135 runs, averaging 37.45. He was one of only three men to pass 2,000 runs; he was second to Hayward in the Surrey averages, and eighth nationally. His performances brought him to the attention of the Marylebone Cricket Club (MCC) selectors, and he was chosen for the Players in the prestigious Gentlemen v Players matches in July, although he scored few runs in either game. Hobbs was selected to tour Australia in the 1907–08 season with an MCC team, given his opportunity by the unavailability of several leading players. Throughout the outward voyage, Hobbs was severely affected by sea-sickness, a condition which afflicted him on sea voyages throughout his life; in later tours, he travelled overland as far as possible to reduce his time on ships. Consequently, he missed the first two games of the tour against the Australian state teams. His appearances were further limited by the reluctance of the MCC captain, Arthur Jones, to select him. He played in only two of the early matches, failing on both occasions, and was left out of the team for the first Test match. After England lost the game, Hobbs was chosen for the second Test. Hobbs made his Test debut on 1 January 1908 at Melbourne Cricket Ground. Opening the England batting on the second day, Hobbs scored 83 runs in 182 minutes. Eventually, England needed 282 to win and did so by one wicket; Hobbs scored 28. He retained his place for the rest of the series. In the fourth match, he scored 57 on a pitch badly affected by rain; by adopting a policy of attacking the bowling he hit ten fours. He concluded his series with an innings of 72 in the final game, but could not prevent a third successive English defeat—the home side won the five-match series 4–1. He scored 302 runs in the Tests at an average of 43.14. In other first-class matches, he scored centuries against Tasmania and Victoria, totalling 876 runs at 41.71. Having established a lead in the series, England began the fourth Test by bowling Australia out for 191. At the end of the first day, Hobbs and Rhodes had scored 54 together, and the next day they took their partnership for the first wicket to 323, setting a new record for the highest partnership for any wicket in Test matches. Their partnership remained an overall Test record for 22 years and the highest for the first wicket until 1948. As of 2016, this remains England's highest opening partnership against Australia. The pair scored easily from the bowling but faced criticism for slow batting. Even so, Hobbs reached a century in 133 minutes and proceeded to play more aggressively afterwards. He was finally dismissed for 178. England reached a total of 589 and bowled Australia out for 173 to win the match by an innings and regain the Ashes. England also won the final Test to take the series 4–1; Hobbs scored 32 and 45, sharing a partnership of 76 with Rhodes in the second innings. Hobbs ended the series with an aggregate of 662 runs at an average of 82.75, setting a new record number of runs for an individual batsman in a Test series. His average was far greater than any other batsman on either team, and the tour established him as the world's best batsman. In addition, he ran out 15 batsmen while fielding at cover point. The Australians did not dare run when he fielded the ball for fear of the speed of his throw. In all first-class matches, Hobbs scored 943 runs at 55.47. When first-class cricket resumed in 1919, Surrey awarded Hobbs a five-year contract worth £400 a year. During the season, he began to open the batting with Andy Sandham, who succeeded to Hayward's position as Hobbs' partner; in the following years, the pair established an effective partnership. In total, they shared 66 century opening partnerships and averaged over 50 for the first wicket. Like Hobbs' other successful partnerships, this one was based on quick running. Sandham, even when successful, was often overshadowed by his partner; on one occasion, Sandham scored a century but the headlines were reserved for Hobbs' duck. Sandham usually played the subordinate role and Hobbs took most of the bowling. Hobbs made a good start to the 1919 season and, despite a brief spell of failure through over-aggression, batted consistently. He scored a double century for Surrey against a touring Australian Imperial Forces cricket team and centuries in each of the three Gentlemen v Players matches—the only player ever to do so in one season. His rescheduled benefit match raised £1,670, money he used to open a sports shop in London. The shop was successful and he ran it until just before his death. The additional income gave him considerable financial independence. In total that year, Hobbs scored 2,594 runs in first class matches, more than anyone else, at an average of 60.32. After a winter working in his shop, his good form continued into 1920. Four of his eleven first-class centuries came in consecutive innings in June, and he totalled 2,827 runs at 58.89. He also took five wickets for 21 runs against Warwickshire, and his 17 wickets at an average of 11.82 placed him at the top of the Surrey bowling averages. Hobbs signed a new contract worth £440 a season before the 1924 season. His form recovered to the extent that his biographer, John Arlott, described it as the beginning of "his quite phenomenal second lease of cricketing life". Batting conditions were good throughout the summer and Hobbs' opening partnership with Sandham for Surrey began to approach its peak of effectiveness. Hobbs also established an opening partnership with Yorkshire's Herbert Sutcliffe; the pair had opened together briefly in previous seasons and were chosen to open in a Test trial early in 1924, beginning a six-year Test association. They were often successful in difficult batting conditions; Hobbs, generally the dominant partner, usually faced more of the bowling. By the time of his retirement, they had opened the batting 38 times in Tests, shared 15 century opening partnerships, and added 3,249 runs together; their average partnership was 87.81, the highest in all Tests for a pair of opening batsmen as of 2016. In all first-class matches, they had added 100 for the first wicket 26 times and had an average partnership of over 77. As with Hobbs' other partnerships, they ran well between the wickets, and established a particular reputation for reliability; according to McKinstry, they became an "English institution". The cricket writer Gerald Howat suggests that "'Hobbs and Sutcliffe' became almost a synonym for English stability." The MCC team which toured Australia under the captaincy of Arthur Gilligan in 1924–25 lost the Test series 4–1, but critics thought the winning margin flattered the host country. Between them in the Test matches, Hobbs and Sutcliffe scored seven centuries and shared four opening partnerships which passed 100 runs. Hobbs began the tour well, and scored consistently in the matches before the Tests. In the first Test, in reply to Australia's first innings of 450, Hobbs and Sutcliffe opened with 157 runs. Hobbs went on to his seventh century against Australia, beating the previous record number in England-Australia Tests by Victor Trumper. Australia eventually set England a target of 605 runs. Hobbs and Sutcliffe shared their second century opening partnership of the game, but England lost by 193 runs. During the match, Hobbs became the leading run-scorer in Test cricket, passing the previous record of 3,412 runs set by Clem Hill in 1912. In the second Test, Australia scored 600 during the opening two days. In reply, Hobbs and Sutcliffe batted throughout the third day without being separated, scoring 283. They concentrated on defence but both men reached centuries, and the press praised their achievements. Even so, Australia won the game by 81 runs, and in the aftermath of the defeat, Cecil Parkin, a former Test bowler and vocal critic of Gilligan's captaincy, wrote a newspaper article suggesting that Hobbs should assume the leadership of the side. This suggestion provoked a reaction from Lord Hawke—"Pray God, no professional will ever captain England"—and subsequent press debate over the idea of Hobbs as captain. In reality, Hobbs had no desire to captain England. Hobbs began 1930 in good form, and, with Rhodes, was added to the selection panel again for the Ashes series that season. In the first Test, Hobbs scored 78 and 74; he top-scored in both innings, but failed in the next two Tests. Before the third and fourth Tests, feeling tired and concerned by his form, he offered to stand down but the other selectors declined his suggestion. When he batted in the fourth Test, he shared an opening partnership of 108 with Sutcliffe, their 11th century stand against Australia. After two hours batting, he was out for 31. With the series level at 1–1, the final Test was to be played to a finish, but before it began, Hobbs announced that it would be his last. Shortly after making the decision, he returned to form, scoring a century and passing, in his next game, W. G. Grace's record career-aggregate of 54,896 first-class runs. Before the deciding Test, the selectors sacked Percy Chapman as captain. 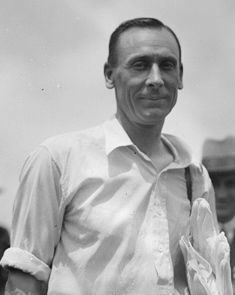 The press speculated that Hobbs would replace him, but Bob Wyatt was chosen; Hobbs may have turned down an offer of the captaincy at the meeting of selectors. In the match, Hobbs scored 47 in the first innings. When he came out to bat in the second, in the face of a large Australian first-innings lead, Hobbs was given an ovation by the crowd and the Australian fielders gave him three cheers. Hobbs was moved by his reception but scored only nine runs before he was dismissed, and Australia won the match and series. In his final series, he scored 301 runs at 33.44. In 61 Tests, he had scored 5,410 runs at an average of 56.94. He retired as the leading run-scorer in Test matches, a record he held until it was passed by Wally Hammond in 1937. Maintaining his form for the rest of the season, Hobbs scored 2,103 first-class runs in 1930 at 51.29. During the winter of 1930–31, Hobbs and Sutcliffe joined a private team run by the Maharajkumar of Vizianagram which toured India and Ceylon. Hobbs was very popular with the crowds, and scored 593 runs. These runs, and in particular the two centuries he scored, were to prove controversial. Hobbs never believed that the matches were, or should have been, of first-class status, but statisticians later judged them to be first-class. Wisden never recognised the centuries and so records his century total as 197. Other authorities give 199 centuries. Despite using a more limited batting technique, Hobbs remained successful in 1931. He played several representative matches and took part in the 150th century opening partnership of his career. In total, he scored 2,418 first-class runs in the season at 56.23. In 1932, despite missing several matches owing to injuries and fatigue, he scored 1,764 runs at 56.90, including centuries in each innings against Essex. According to Mason, this latter performance prompted Douglas Jardine to nickname Hobbs "The Master". Hobbs scored 161 not out for the Players against the Gentlemen, his 16th century in the fixture, to pass the record total of Grace for the Gentlemen. Hobbs was partially involved in the Bodyline controversy in Australia in 1932–33. Late in the 1932 season, Bill Bowes consistently bowled short-pitched deliveries against him in a match between Surrey and Yorkshire. Bowes was criticised in the press and particularly by Pelham Warner, who was to manage the MCC team in Australia. Hobbs accompanied the team to Australia as a journalist, writing for the News Chronicle and The Star, accompanied by his ghostwriter Jack Ingham. During the tour, Hobbs neither condemned Bodyline nor fully described the English tactics. Other journalists admired Hobbs but dismissed his writing as "bland". When he returned to England, Hobbs openly criticised the English tactics in newspaper columns and in a book he wrote about the tour. In 1933, playing less frequently, he scored 1,105 runs at 61.38, aged 50. After missing the first games with illness, he scored 221 against the touring West Indian team, to the acclaim of the press. He did not play every game, and the Surrey committee allowed him to choose which matches to play. More centuries followed later that season, which took him to 196 in his career, fuelling anticipation that he would reach 200 centuries. That winter he accompanied the MCC team in India as a journalist. Before the next season, Surrey constructed a new entrance to the Oval which was named after Hobbs. In 1934, he scored 624 runs at 36.70. After a solid start, he scored his final first-class century against Lancashire. After this he played irregularly, and his batting began to appear uncomfortable. Hobbs realised his career was over: in February 1935, he announced his retirement. There were many tributes and a public dinner was held in his honour which was attended by many leading figures in cricket. In all first-class cricket, Hobbs scored 61,760 runs at an average of 50.70 according to ESPNcricinfo. Later in 1935, Hobbs was made an honorary life member of Surrey. Hobbs and his wife lived in rented property for the first years of their marriage. His earnings placed them roughly in the bracket of lower middle class according to McKinstry: although more prosperous than he had been during his childhood, the family were not initially financially comfortable. Hobbs' wages increased with his reputation so that by 1913, he was earning £375 each year, placing his family within the bracket of the London middle class. After several years of moving from one property to another, he was able to buy his own house in 1913, in Clapham Common, a prosperous area of London. By the middle of the 1920s, cricket in England was extremely popular and the players were famous. Hobbs was the biggest attraction and a combination of his cricket earnings (estimated to be around £780 each year), the income from his business, product endorsement—he was one of the first cricketers to benefit from lending his name to commercial products—and ghostwritten books and articles made him relatively wealthy. According to McKinstry, his annual earnings probably reached £1,500 a year by 1925, more than a family doctor at the time. Consequently, in 1928 the family moved to a large house in private grounds and Hobbs was able to send his children to private schools. He had greater financial independence than most contemporary cricketers, but was always first concerned to give his family the security lacking from his childhood. In 1953, Hobbs was knighted, the first professional cricketer to be so honoured. He was reluctant to accept and only did so when convinced that it was an honour to all professional cricketers, not just himself. In the same year, John Arlott formed the "Master's Club", a group of Hobbs' friends who met regularly to toast him. Hobbs remained active into the 1960s, including working in his shop. By the late 1950s, Ada was wheelchair-bound and Hobbs spent most of his time caring for her. She died in March 1963. Hobbs' health began to fail shortly afterwards and he died on 21 December 1963 at the age of 81. He left £19,445 in his will and was buried in Hove Cemetery. A memorial service was held at Southwark Cathedral in February 1964.